The publish dialogue fails to open the online account configuration. That should open the account configuration panel from settings. The fix just changes the command called by that code, so there is no real risk of regression. Sebastien, this seems to be affecting a number of people. Is there some reason this is marked Low? Jim, I can bump the setting to high if you want but I doubt it's going to make a difference. So, first: If the users install ubuntu-online-account, does that fix the problem for them? If so, we should communicate that to them. As far as easy solutions, if adding back the dependency is off the table, then my only other suggestion is to distribute an unmodified version of Shotwell (or, at least, w/o the UOA plugins and w/ Shotwell's). I suspect that's also off the table, in which case I don't have any suggestion other than more code changes, i.e. a warning dialog. How can I elevate this with those teams (i.e. who should I email)? This is really a poor situation for our users. The patch that introduces UOA support in shotwell, needs to be tweaked to fallback to the upstream behaviour if UOA is not installed. We have no intention of shipping a seperate shotwell build. Also adding a depend on UOA pulls in pretty much the entire unity-control-center stack, so clearly that is not an option either. I am using Ubuntu 14.04 and this happened also to me both on Gnome and Unitiy desktops. BUT after I established my Google account in "System Settings -> Online Accounts" this worked perfectly for me, i.e. need to establish the account first ! I wish it was as simple as Heiðar's case...I actually have set my google account which works for evolution calendar linked to google calendar and empathy with google talk/hangouts; but for Shotwell and PiCasa publishing still doesn't work. Any news? I changed to XFCE expecting better things. Running Gnome Shell Ubuntu 14.04, same error. I have already set up my flickr and google accounts in Online Accounts, could only see Piwigo, though in preferences I can see that Flickr and Facebook were there. At this point the dialog disappears and if you run via the command line I get the same message as described above. While I understand using 'ubuntu online accounts' is a way to accomplish adding an account; I would hope that the dialog wouldn't close without any information. Accepted shotwell into trusty-proposed. The package will build now and be available at http://launchpad.net/ubuntu/+source/shotwell/0.18.0-0ubuntu4.1 in a few hours, and then in the -proposed repository. I've tried what Chris suggested and actually the ubuntu-online-account appeared to me (so the bug is partially solved), the problem is I still cannot add PiCasa web publishing account in that dialogue window! 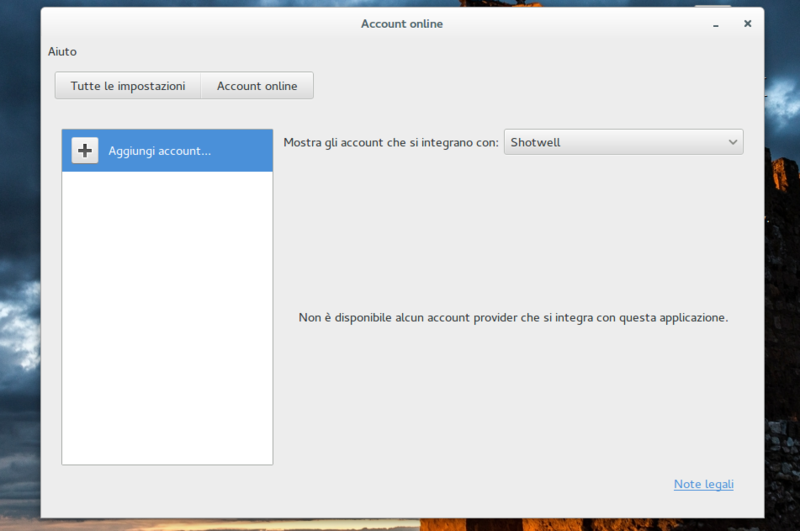 I've already set my google account in the online accounts and it's perfectly working for the calendar and empathy IM, but when I try to set in the ubuntu-online-account dialogue, by clicking on the menu "show accounts related with--> Shotwell" I got the message "there are no available account provider related with this application" (I'm attaching a screenshot, sorry it's in Italian). the version that ships it. sorry it was my fault not to understand...I finally found the right package simply in the software centre named as a "account-plugin-google", I've just tried and it works like a charm! Ehm. In WHAT universe does this fix the issue that shotwell doesn't work in non-UOA environments? I agree with Jens, as I understand things this is still a problem with non-UOA spins. Could someone re-open the ticket? This bug exist on about 10 PC I manage. then here is the result when I click on Publish button then select the create new account option in the top right corner. L 5807 2014-10-24 07:22:50 [DBG] PublishingUI.vala:322: PublisingDialog: discovered 5 pluggable publishing services. L 5807 2014-10-24 07:22:50 [DBG] PublishingUI.vala:337: PublishingDialog: discovered pluggable publishing service 'YouTube'. L 5807 2014-10-24 07:22:50 [DBG] PublishingUI.vala:337: PublishingDialog: discovered pluggable publishing service 'Flickr'. L 5807 2014-10-24 07:22:50 [DBG] PublishingUI.vala:337: PublishingDialog: discovered pluggable publishing service 'Picasa Web Albums'. L 5807 2014-10-24 07:22:50 [DBG] PublishingUI.vala:337: PublishingDialog: discovered pluggable publishing service 'Facebook'. L 5807 2014-10-24 07:22:50 [DBG] PublishingUI.vala:337: PublishingDialog: discovered pluggable publishing service 'Gallery3'. L 5807 2014-10-24 07:22:50 [DBG] ConfigurationInterfaces.vala:331: ConfigurationFacade: engine reports property 'LAST_USED_SERVICE' changed. L 5807 2014-10-24 07:22:50 [DBG] PublishingPluginHost.vala:114: ConcretePublishingHost.start_publishing( ): invoked. L 5807 2014-10-24 07:22:50 [DBG] GalleryConnector.vala:837: GalleryPublisher: starting interaction. L 5807 2014-10-24 07:22:50 [DBG] GalleryConnector.vala:926: ACTION: showing service welcome pane. L 5807 2014-10-24 07:22:50 [DBG] PublishingUI.vala:573: PublishingDialog: install_pane( ): invoked. L 5807 2014-10-24 07:22:56 [DBG] PublishingUI.vala:514: PublishingDialog: on_close_cancel_clicked( ): invoked. L 5807 2014-10-24 07:22:56 [DBG] PublishingPluginHost.vala:100: ConcretePublishingHost.stop_publishing( ): invoked. L 5807 2014-10-24 07:22:56 [DBG] GalleryConnector.vala:867: GalleryPublisher: stop( ) invoked. I already had Picasa configured. But after I upgraded to Trusty, functionality seems to have been lost. I get the "Publish" dialog box, but nothing else happens, and the only clickable button is "Cancel." Since this bug only fixed the issue when Unity is installed, I have reopened bug #1244099 to deal with remote publishing with GNOME and Xfce, which do not have ubuntu-online-account. I know Google has already discontinued Picasa in favor of Google Photos, so at first I was not surprised "insert" is not valid in Google's Picasa API . However, with more investigation, I couldn't find any separate API for Google Photos (it seems that the Picasa API still serves as the API for Google Photos). So, perhaps there is something wrong with *this* API interaction. Although I've setup the Google account in Ubuntu System Settings -> "Online Accounts", I'm unable to use that account in Shotwell to publish to 'Picasa' (Google Photos). I get a 400 error Invalid request. L 16198 2017-03-15 14:31:16 [WRN] RESTSupport.vala:189: response validation failed. bad response = 'Insert is no longer supported'. You are trying to create a new album. this is not supported anymore. Recent versions of Shotwell (0.25.90) don't offer the option anymore.